Atsushi Takenouchi joined Butoh dance company "Hoppo-Butoh-ha" in Hokkaido in 1980. His last performance with the company "Takazashiki"(1984) was worked on by Butoh-founder Tatsumi Hijikata. He has been working on his own Jinen Butoh since 1986 and created solos "Tanagokoro", "Ginkan", "Itteki" as a universal expression of nature, earth, and ancient times and his impressions of the moment, formulated from the people around him, and the environment. He toured Japan between 1996 and 1999. He also studied a spirit of the universe under Kazuo Ohno and Yoshito Ohno. In 1999 he toured Jinen Butoh "Sun & Moon" and led Butoh workshops in Europe and Asia for six months. Since autumn 2002 he has been mainly based in Europe for one year arts fellowship funded by a Japanese government. And he has been working on Butoh dance collaboration project with dancers and actors in France, Poland and other countries. 2005 July, he presents his solo performance "Stone" at Theatre Golovine in Avignon. And choreograph a Butoh procession with 30 dancers through Avignon city in the festival. The Chorea Theatre Association was created in 2004, as the result of the fusion of two groups, the Ancient Orchestra and the Labyrinth Dance Formation, which began their activity in 2001 at the Centre for Theatre Practices “Gardzienice”. The aim of the Association is to reconstruct ancient greek chorea - that mode of ancient theatre in which music, word and gesture are unified - through the language of contemporary theatre. The Association is led by Tomasz Rodowicz, a co-founder of the Centre for Theatre Practices "Gardzienice". They work with young artists, actors, dancers and musicians from across Poland. 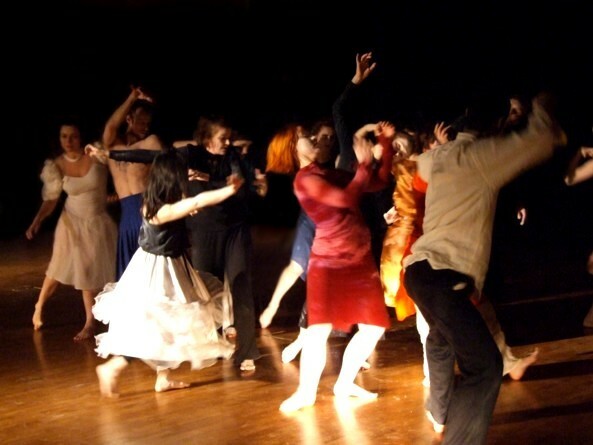 Previous performances include Hode Galatan (2004) and Tezeusz w Labyrincie [Tezeus in the Labyrinth] (2004), After the Birds (2005) cooperation with Earthfall Dance Company - innovative physical dance theatre based on a policy of forging radical choreography with live music and strong visual imagery, Dance of the Forest (2006) performance with butoh choreography of Kan Katsura, prepared in cooperation with international group of butoh dancers (Limen Theatre & guests). The project takes place in the rehearsal room of Center of Education and Culture - Centrum Lowicka, 21 Lowicka Street in Warsaw, Poland. Jinen performance is an improvisational dance. It is based on Atsushi Takenouchi’s impressions of the moment, formulated from the people around him, the space, the air, the climate and energetic mood of the surroundings and spirit of the moment. Having had dancing tour in the various nature stage in Japan (1996-1999) in order to face to the origin of it, he had encountered very native Japan which was ancient but still alive, being hidden in the each lands, climates, peoples, music, customs, languages and the other localities. It probably is the source of a myriad of gods. He has absorbed it directly during this travel of more than 3 years. And now his stages have been expanded to the world with no bound endlessly. He feels that dancing in harmony with nature has brought back the memories, which were sleeping, in his DNA. He uses the memories of once being a tree, grass, animal, wind, soil, fire or water in his dance. He also dances on the stages of theaters and halls, feeling the life of the earth and harmonizing with the air and the environment. "The body is a container for one soul, which cannot be changed by anything." Dancing with those bodies is a common culture for all human beings. Performing this primitive dance in the space of nature where people have gathered together since ancient time, where music and dance were born from prayer, is an important ceremony which traces where we came from and where we are going. Apoptosis (gr. willing and falling of leaves) genetically programmed suicidal death of cell. The performance Apoptosis is a series of poetic pictures linking apoptosis with Japanese theory of “decision of death” coming from Bushido The Worrior Way. Limen Theatre (Teatr Limen, based in Warsaw/Poland) was created in 2002 by Sylwia Hanff. It is body theatre, using many techniques, but mainly concentrated on butoh dance. The theatre performed at many international festivals and received awards at dance/theatre competitions. Entry to the evening of performances is free for workshop participants.